With Hollywood marketing budgets reaching over a hundred million dollars per blockbuster, it’s easy to get the impression that cinema trades exclusively in bloated, effects-heavy escapist entertainment. Sure, we have a vague awareness of smaller, indie films existing somewhere in the ether, but who the hell knows when and where they’re being released? 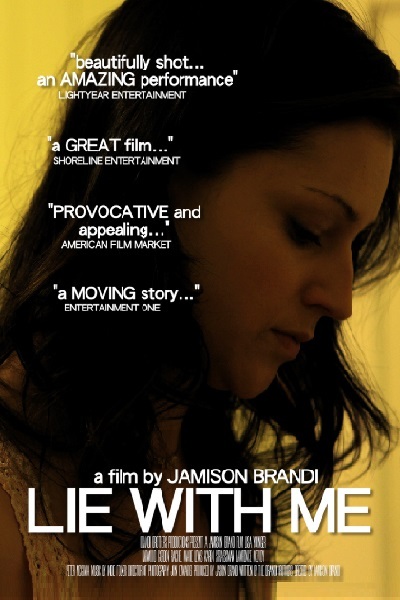 As such, I find it incumbent upon me to mention right off the bat that Jamison Brandi’s Lie with Me now on Vimeo on Demand and will open in select theatres this coming January. 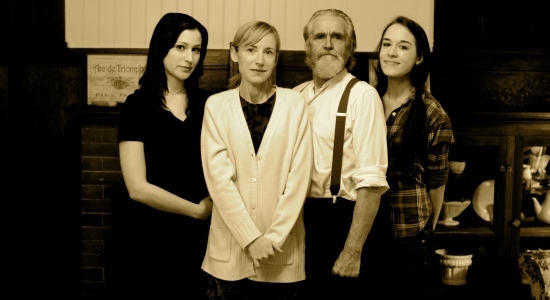 Adapted from a play by Keith Bridges and produced with the amount of money James Cameron spends on a haircut, Lie with Me tells of an Irish prostitute named Carla (Lisa Younger) returning home with her boyfriend (Lawrence McEvoy III) to take care of her dying mother (Karen Strassman) and bury the past once and for all. She specialises in handicapped Johns, and a local priest (Peter Michael McGowan) refers to her services as a “gift”, so I assumed her touch somehow cures the ill. However, the movie never confirms this. In fact, it never confirms much of anything, which is sure to frustrate some and engross others. There’s a certain elegance in the way Lie with Me dances around the facts, forcing viewers to piece together the obvious and ponder its significance. For example, the youngest in the O’Shannon family, Susan (Rachel Marie Lewis), begrudges Carla for always stealing her boyfriends, but it’s clear most of that narrative is made up, leaving us to wonder what kernel of emotional truth motivates her complaint. Also, her dad, Stan (Harwood Gordon), travels in a wheelchair like our heroine’s clients. Make of that what you will. I dare not spoil any more of the plot, except to say that it comes dangerously close to romanticising something that people really, really shouldn’t. Intriguingly, that’s a common trope in fiction pertaining to national identity, and, sure enough, Brandi punctuates the ordeal with various shots of the O’Shannons hanging their Irish flag and roaming the countryside. Such quiet, pensive moments have become a rarity in American cinema, and part of me wishes they made up the entirety of Lie with Me, which, in fairness, they almost do. Consider how much more we learn of the characters when Carla pushes Stan across a field than in their subsequent conversation. A lot of credit goes to Lisa Younger, who somehow allows us into her character’s thoughts all the while keeping every card close to the chest. Come to think of it, given the budget of Lie with Me, I’d say the whole cast does a remarkable job, save perhaps for Rachel Marie Lewis, whose approach strikes me as better suited for the stage. By this, I mean that she projects Susan’s complex feelings for the folk in the back row, but the camera (and therefore the viewer) is standing just three feet from her. Then again, I can understand any actress struggling with the dialogue in Lie with Me. You know those wonderful “aha!” lines that make you realise how profound a screenplay is? Imagine a film comprised entirely of such revelatory exchanges without any of the mechanics building up to them. The result is not unlike watching a pop singer take on the national anthem. At first, you’re taken by the talent on display. Then all the riffs start to drown each other out, and you soon find yourself wishing the artist would stick to the smaller notes once in a while. Look, Lie with Me isn’t for everyone, though you’d be hard pressed to find a jaded soul unable to appreciate Brandi’s achievements here, especially in terms of cinematography. He and director of photography Jon Edwards have crafted with two hundred and fifty thousand dollars a richer visual experience than in over half the schlocky blockbusters out there. Seriously, the movie is positively gorgeous. More to the point, if you’ve only experienced mainstream Hollywood cinema, you can’t know whether you’ll love or hate this more challenging side of the medium. Don’t you owe it to yourself to find out?